Brighton is a city of two faces. Day trippers amble through the perfectly-preserved contents of a 19th century time capsule, soaking up the gaiety of a classic British seaside resort. Nightclub revellers energise a dynamic music scene, absorbing the gay-ety of England’s LGBT capital. 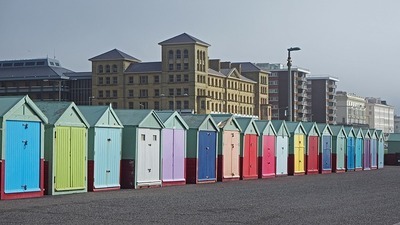 In a country that attracts criticism for the cookie-cutter aesthetic of many major cities, Brighton stands out as a destination with character. Like fish and chips, or vodka and cranberry, a visit to Brighton requires a careful balancing act between the two complementary ingredients. We’ve rounded up the essential period landmarks and seasoned with suggestions for navigating the city’s flamboyant arts scene. Built as a seaside retreat for King George IV, this Regency-style palace features visualinfluences from China and India. 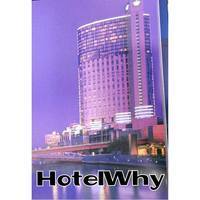 Today, it is the most easily-recognised location in the city. Domed roofs and pavilions evoke a jumbled spirit of the Orient; a pick-and-mix attitude to aesthetic resulting in a palace like no other. The Royal Bedrooms are a festival of clashing colours; the opulent Music Room is dominated by bold chandeliers; the Banqueting Room is furnished with bizarre tropical sculptures. 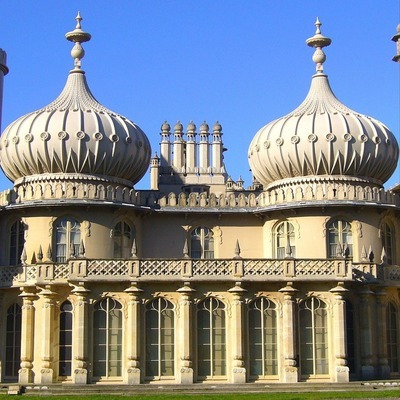 The Royal Pavilion is an essential item on any Brighton tourist itinerary. abundance of leisure time, at the same time as creating a poignant contrast to the gentrification and bourgeois culture of the town centre. Emblematic of British culture, it’s been featured in films including Brighton Rock and Sweeney Todd: The Demon Barber of Fleet Street. Brighton plays host to Britain’s best-attended Pride Festival each summer. Around 400,000 visitors descend on the city for a week in August to participate in a parade, a festival in Preston Park, the Gay Village Party, numerous club nights, an Arts and Film festival and – since 2013 – a Pride dog show. The celebration is not only beloved to Brighton’s LGBT crowd, but also city councillors, who observe an £18 million boost for the local economy. With Britney Spears headlining the main stage in 2018, it’s no surprise that Pride has earned international renown. This twisting maze of narrow alleyways houses a vast array of independent shops and boutiques. The rambling layout of the street plan is a relic of times when Brighton was still a small fishing village. Most of the retailers based in these quirky quarters sell jewellery, though Italian restaurateurs also claim a significant share of business. Scattered amongst these are a number of specialty stores: tourists might recognise chocolatier ‘Choccywoccydoodah’ from the TV series of the same name. Concealed by the imposing exterior of a former church, this contemporary art gallery has an educational mission. Artists are commissioned to create installations specific to the building, to test the boundaries of their imagination, and to engage with visitors in conversation about their work. Fabrica has a busy programme of exhibitions and events, and it’s worth checking out the calendar before you visit – particularly if you might have time to hit the After Hours Bar during ‘Friday Lates’. Catering to Brighton’s foodie crowd, St James’ Street is one of Brighton’s busiest areas. This street and the corresponding area of seafront also combine to constitute the city’s gay village. A lively LGBT community supercharges a cool café culture, but all are welcome here: it’s shabby, vibrant and few buildings have been updated since their original construction, curating a sense of pride in shared history amongst local residents. 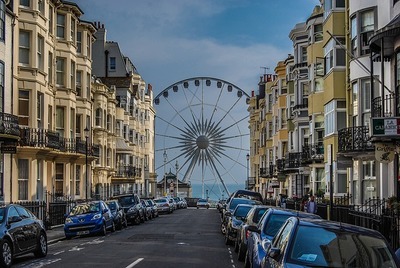 One of Britain’s favourite tourist destinations of the past two centuries, Brighton has had ample time to develop quick and convenient transport links. Taking an Easyjet flight to London Gatwick will place visitors within half an hour of Brighton by public transport. YourParkingSpace to search and book a convenient space in advance.